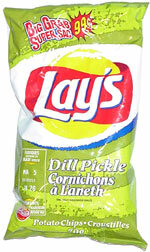 Taste test: These have a mild pickle taste, with a good balance of spices. They're not nearly as pickley as some pickle chips, but they're pretty good. Smell test: Smells like a pickle, like the ones in a McDonald's hamburger. This snack was discovered by Jeremy at Depanneur de la Gare, Montreal, Quebec, Canada.